I am not looking for a position as a full-time employee. Thanks anyway. I usually work directly with my clients. While I am not opposed to contracting through an agency, I only work on an Independent Contractor (1099, not W-2) tax basis. I am happy to meet with clients wherever and whenever necessary, but I do the bulk of my work from my own office. I do not take jobs that require a full-time on-site presence. Using APL+Win to develop Windows applications with interactive charts and graphs for Winklevoss Technologies (WinTech), which provides cutting edge technology for valuing, projecting, analyzing and administering pension plans and retiree life and medical plans. ProVal PS is a desktop toolkit for plan sponsors. SimMetric is a tool for the strategic management of Endowments & Foundations. Developed numerous Web sites for various small companies. From 1996 to 1998, headed the development and maintenance of a large (~1500 pages) Web site for CIGNA Corporation, a major insurance and financial services company. Performed server administration, CGI programming, HTML coding, access log analysis, etc. Ported a large application from mainframe VM/CMS to a Windows NT LAN, converting APL2 to Dyalog APL/W and SQL/DS to Oracle. From 1990 to 2004, provided ongoing consulting for a Mobil Oil product safety and environmental affairs application which automated responses to many EPA and OSHA requirements and was accessed by hundreds of users around the world. Used VM/CMS, APL2, REXX, XEDIT, CMS Pipelines, GDDM, etc. Also provided DBA support for a massive SQL/DS database. Contributed several programming tools distributed by Dyadic Systems with their Dyalog APL/W product. Developed a PC-based 3270 emulation software package for remote dial-up use of mainframe systems via IBM Series/1 and 7171 protocol converters. Installed and set up PC systems for numerous small businesses. Trained novice users. Customized application software when appropriate. Published several papers for ACM/SIGAPL-sponsored conferences on effective use and customization of APL/W, APL2, XEDIT, REXX, and SQL. Created a shareware utility program to add APL font support for HP LaserJet printers to Microsoft Word (DOS). Designed and implemented a multi-user IBM mainframe payroll and scheduling system for Mobil Oil using APL2, SQL/DS, GDDM/IMD, and Script. Performed SQL database administration functions. Consulted on an IBM PC and LAN-based integrated manufacturing application for a Bristol Myers manufacturing plant in Holland. Designed, programmed and documented two PC products (screen panel design and file documentation tools) distributed by STSC, Inc. with their APL*PLUS/PC product. Developed a mortgage backed bond pricing analysis system for an investment banking company using IBM's PC APL. 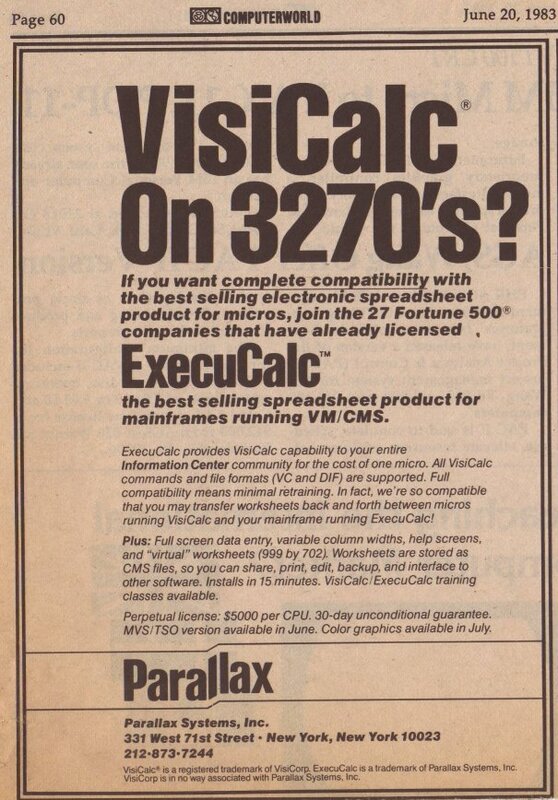 Parallax developed and marketed ExecuCalc, the first mainframe "visi-clone", which duplicated the features of VisiCalc and Lotus 1-2-3 on IBM mainframes with 3270 display terminals (see ad). Over 150 copies were licensed (35 to Fortune 500 companies). Designed and programmed the ExecuCalc product using IBM's VS APL, GDDM, and AP124X for mainframes running VM/CMS and MVS/TSO. Wrote all documentation, and performed customer support and maintenance. Held numerous positions, including Branch Manager (New York City), Technical Director (Eastern Region), and Marketing Manager (International). Hired, trained and managed marketing, technical and administrative staff in both the U.S. and Europe. While managing New York City branch office, responsible for annual revenues of $3.7 million. Sold and implemented applications for budgeting, pricing, acquisition analysis, sales tracking, quality control, graphics, manufacturing, and accounting. Taught introductory and advanced APL courses to hundreds of students, mostly corporate employees with no prior programming experience. Also trained other STSC trainers. Developed utilities and programming standards for company-wide use. Exhibited, gave demonstrations, presented papers, refereed papers, and chaired panels at trade shows and annual ACM/SIGAPL conferences. Operated IBM 1401 and 360 systems. HTML, Perl, FTP, Telnet, etc., etc. 1997-2014: Member of the Board of Finance of the Town of Washington (Connecticut), which oversees the town budget and sets the property tax mill rate. 2002-2008: Created and maintained municipal web site for the Town of Washington, Connecticut. 1991-1997: Member of the board of trustees of the Gunn Memorial Library (the public library in Washington, Connecticut); treasurer of $2.5 million capital fund raising campaign.